What Do You Hear on the Best Hot Stamper Pressings of Quadrophenia? They just plain ROCKED HARDER than the other copies we played. Yes, they’re bigger. Yes, they have more weight and whomp down low. Yes, they are smoother and more natural up top. Posted in *Our Record Overview - The Good, Advice - Louder Is Better, Advice - What to Listen For - Energy, Genre - Rock - Big Production Rock, Genre - Rock - Big Rock Sound, Labels We Love - Track, Our Top 100 Rock and Pop List, Top Artists - The Who, Top Engineers - Ron Nevison on May 6, 2017 by humorem. … And thanks again for that amazing “Who’s Next” record. It was startling to hear the difference between that and the Classic – and that was one of the better modern audiophile records!I can’t tell you how many modern reissues I’ve bought over the past couple months that have lost, and lost badly, to just my one single original or early pressing of an album. Reissues by AC/DC, The Who, ZZ Top, The Rolling Stones, and Patti Smith have all failed miserably against my merely average sounding originals. Posted in *Our Record Overview - The Good, Advice - Audio Progress, Advice - Record Collecting for Audiophiles in General, Advice - Record Shootouts, Heavy Vinyl Mediocrities, Labels We Love - Track, Top Artists - The Who, We Get Letters and tagged *Our Record Overview - The Really Not Good At All, audiophile vinyl, Better Records, Heavy Vinyl, hot stamper vinyl, Hot Stampers, hot stampers vinyl, tom port on March 10, 2017 by humorem. Which Album by The Who Has the Best Sound? I don’t know of another Who album with such consistently good sound — song to song, not copy to copy, of course. Just about every song on here can sound wonderful on the right pressing. If you’re lucky enough to get a Hot Stamper copy, you’re going to be blown away by the Tubey Magical Guitars, the rock-solid bottom end, the jumpin’-out-of-the-speakers presence and dynamics, and the silky vocals and top end. Usually the best we can give you for The Who is “Big and Rockin,” but on Tommy, we can give you ’60s analog magic like you will rarely hear in the decades to follow. Acoustic guitar reproduction is key to this recording, and on the best copies the harmonic coherency, the richness, the body and the phenomenal amounts of Tubey Magic can be heard in every strum. What do high grades give you for this album? Silky, sweet vocals; huge weight to the bottom end; “you are there” immediacy; BIG drums, off the charts rock and roll energy, and shocking clarity and transparency. No other Who album has all these things in such abundance. 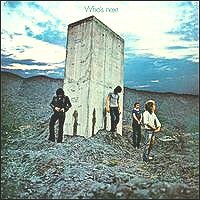 Posted in A List of Albums We're Obsessed With, A List of Personal Favorites, Advice - Understanding Records, Advice - What to Listen For in General, Demo Discs for Tubey Magic, Genre - Rock - Big Production Rock, Labels We Love - Track, Top Artists - The Who on June 4, 2016 by humorem.